The NBA free agency extravaganza began 12:01 this morning. Headlining this event is one capricious, wishy-washy Dwight Howard. This is also the same Dwight Howard who in and out mentally during his first (and maybe his last) season as a Los Angeles Laker. His capricious and buffonish attitude did not sit well with Kobe Bryant. Howard’s style of play is not conducive to coach Mike D’Antoni’s offense (I’m still baffled by that). And frankly, Howard never felt comfortable in Los Angeles. And more importantly, Howard is more preoccupied with being liked than doing what’s best for him. He’d be a member of the Brooklyn Nets (where he wanted a trade to early that season) by now if he didn’t opt during his final year of Orlando. Now having all of that, Howard makes damn near perfect sense for one team: the Houston Rockets. The Rockets have the talent around him that would give him his best chance of winning an NBA title. They already have already with James Harden as the playmaker and good role players around him such as Chandler Parsons and Jeremy Lin. And while the Rockets will be contending with the runner-up San Antonio Spurs and Memphis Grizzlies in the Southwest Division as well as the Oklahoma City Thunder in the Western Conference, Houston would be a heavy favorite to at least reach the NBA Finals. Houston also has strong ties to the Chinese market (from the Yao Ming era and now with Lin), a lot of their games are still shown there, which would be good for Howard’s branding. Howard could also lean on Hall of Famers Hakeem Olajuwon and Clyde Drexler for advice and practically anything he may need help on the court. And if that is not enough, Howard would be coached by Kevin McHale – arguably one of the best big men to play in the NBA. Most of all, Howard would be happier playing at a place where he WANTS to be instead of where he HAD to be (L.A. last season). I mean sure, L.A. could pay Howard the most money to the tune of five years and $117 million while other teams can offer $87 million. L.A. also has the allure, the sexiness, the media exposure any player would probably crave. But being that Howard doesn’t want to be the big fish in an even bigger pond, I think that he would thrive in Houston. He would have a more talented supporting cast who would love to have him. Howard knows that McHale would be more than willing to help him succeed. No matter how much more money the Lakers will throw at Howard, he knows deep down it will not buy him the happiness he has long craved. If Dwight wants to win a championship, he should go to Houston where NONE of the players have a ring rather than stay with the Lakers where Kobe is looking for ring number 6 and the franchise averages a title every 3 years or so. Sorry, but I don’t see it. LA has proven for the last 3 decades that it will do what is necessary to get a title. Also, I seem to remember a guy named Kareem Abdul-Jabbar teaching Andrew Bynum to be the best offensive big-man in the game when his knees allowed it. Seems like the Lakers can give Dwight all that Houston can, and more. As for the Chinese market, the most popular NBA athlete in China (who isn’t of Chinese descent) is Kobe. Seems he could help out there too. No, moving to Houston will only prove that Dwight doesn’t have what it takes to win a title. I 2nd that Bruce Leroy! 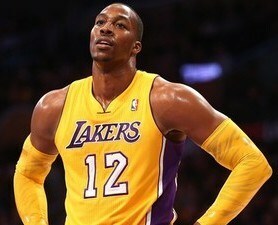 If Howard wants a ring & Big Money he needs to stay in LA! If you can’t make it in Primetime, You don’t deserve a Ring!